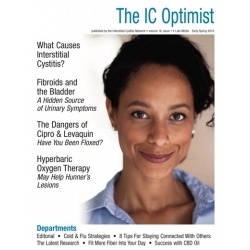 (1) Editorial - Why You Should Care About Ketamine Cystitis - New studies continue to show that this preventable IC like disease is rampant. We must work together to make sure that it does not grow here in the USA and beyond. 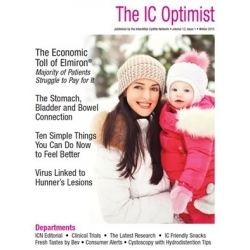 (2) Feature Story - The Past, Present & Future: How Far IC Has Come in 30 Years - For all of our frustration with physicians who still occasionally and mistakenly tell patients that IC is all in their heads, I do want to remind us all of the progress that weve made in the last 30 years. Patients diagnosed today have so many more resources at their fingertips compared to those of us who were diagnosed twenty years ago. 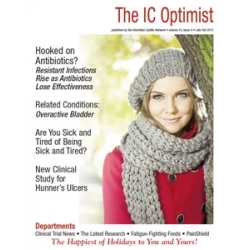 Stacey Shannon offers a lovely retrospective and forecast of the IC movement featuring interviews with many of the brightest IC clinicians and researchers in the world today. 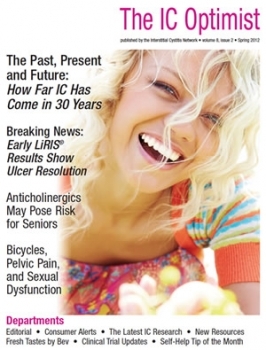 (3) The Latest IC Research - It's time to dive back into the latest IC research with the thrilling breaking news that a new treatment in clinical trials, LiRIS, is showing very good results, particularly in the "healing" of Hunner's Ulcers. This gives great hope that we may soon have a new, effective therapy for patients. Also, several new studies have been released exploring the effectiveness of various bladder instillations. (4) Bicycles, Pelvic Pain and Sexual Dysfunction - We've long known that riding bicycles can exacerbate both IC and pelvic floor dysfunction, yet it turns out that it can also contribute to pudendal nerve entrapment and, for men and women, sexual dysfunction. In this fascinating study, researchers learned why and offered a suggestion on how you can make a bicycle more pelvic friendly. (5) 2012 Clinical Trial Update - Patients without health insurance or who haven't had the chance to work with leading IC clinicians often find clinical trials a great way to receive health care AND receive new treatments. In fact, a new LiRIS clinical study was launched this Spring here in the USA and is available at centers throughout the country. in this article, we share some of the more interesting studies currently seeking participants. (6) Proactive Patients Have the Advantage - Continuing our theme of Past vs. Present, IC author and activist Bev Laumann shares shares more IC milestones in this article. (7) Beware Promises of "Breakthrough Discoveries" and "Cures" - It happened again! Yet another patient bought into an online scam that promises to cure IC if you reduce your salt intake, all for a $37 book fee. She followed the guidelines for a year, only to see her symptoms worsen dramatically. When she called our office, we had to break the news that she'd been scammed. (8) Consumer Alert - Anticholinergics May Post Risk For Seniors - We've known for the past few years that some medications, known as anticholinergics, appeared to cause some cognitive decline in elderly patients but new studies from England and the USA show that it is true and, worse, most of the medications used daily for IC carry high risk. We review the issue so that you can discuss this with your physician and, if necessary, change your medication. (9) Fresh Tastes by Bev - Variety Mushrooms - Bev Laumann, author of "A Taste of the Good Life," offers some great tips on one of the most IC friendly veggies, mushrooms, along with a fabulous recipe! (10) Self-Help Tip of the Month - How To Make a Truly Low Acid Cup of Coffee - From beans to roasting methods to how you brew your favorite cup of joe, it is possible to make a much lower acid, thus more bladder friendly cup of coffee and we share tips on just how you can do it! (11) New IC Cookbook Available - IC Friendly Fit and Fresh - Mia Elliot continues here lovely cookbook series by offering recipes that won't add to your waist line yet give you amazing flavors. Bored with the IC diet?? Once you try the recipes in her three books, you won't be bored again. She's a lovely asset to the IC movement!